"Accommodation - oneId: #2", "Accommodation - oneId: #4", "Accommodation - oneId: #1"
Pickup at the airport then transfer to Hanoi, check in hotel and free time. O/N in Hanoi. 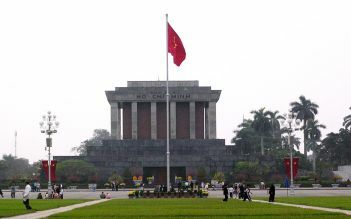 Half-day tour of Vietnam’s capital city, including Ho Chi Minh’s mausoleum (closes on Monday and Friday morning. And closes during October), traditional stilt house, the Ho Chi Minh Museum, and the revered One-Pillar Pagoda. Pay visits to typical Vietnamese places of worship. Just before lunch, tour Vietnam’s first university, the thousand-year-old Temple of Literature. In the afternoon visit to the Ethnology Museum and then time for you to test the bike with assist of our mechanic to make sure you have comfortable and good bike for the big journey. Transfer back to the hotel for shower. After dinner at the restaurant in town, transfer to the Hanoi railway station for the night train up to Lao Cai. Overnight on the train. Arrive at Lao Cai early in the morning. 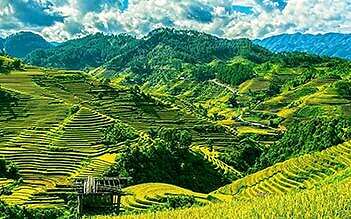 Pickup and transfer to Sapa, breakfast and then trekking tour to visit Y Linh Ho, Lao Chai and Ta Van villages. O/N in sapa. Breakfast, transfer up to Can Cau - a small market situated in a valley surrounded by mountains and only 7 km from China. The market deeply shows the typical cultural features of the minorities in remote mountainous areas in Vietnam. Say goodbye to the market and transfer to Bac Ha. 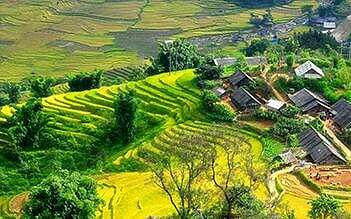 On the way, spend time visiting a village of the Flower H’mong and then check in hotel in Bac Ha. Free to explore the town. Lunch in Can Cau or in Bac Ha and dinner in Bac Ha. Overnight at hotel in Bac Ha..
A breakfast and begin the day with a visit to Bac Ha Market filled with many different hill-tribe peoples. This is the most colorful market in North of Vietnam. At the market, you have chance to enjoy Bac Ha people’s simple but unique kinds of food with special wines made from rice, cassavas, corn and different sorts of fruits such as plumps, apples, peaches...and talking to the minorities through the guide’s interpretation. Leave the market for the H’mong King’s house (King Hoang A Tuong) built by the French colonists and the Chinese in 1920. Return the town for lunch. In the afternoon, spend time visiting another village (Ban Pho village). Say good bye to Bac Ha and get back to Sapa. 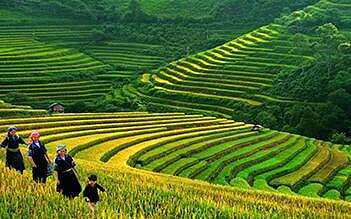 On the way back, drop in to see the Vietnamese and Chinese boder in Lao Cai. Reach Sapa late in the afternoon. Check in hotel in Sapa. Overnight at hotel in Sapa. A walk to Cat Cat village to visit the H'mong, the hydro electric power station built by French people and silver waterfall. Walk back to Sapa and free to explore the town. Lunch and Dinner and overnight at the hotel. Strolling through the market early in the morning in Sapa, where you will meet many different ethnic minority communities such as Black H’Mong, Red Dzao, Dzay or even Xa Pho. 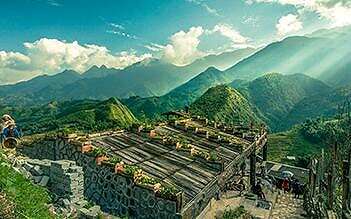 After the market, you will drive up to Heaven Gate and start down hill through most spectacular road to Tam Duong with stops to visit villages of different Ethnic Minorities en route. Arrive in Tam Duong in late afternoon. After check-in, free time until dinner at a local restaurant. Overnight at the hotel. Depart Tam Duong in the morning and follow a remote road. You will visit small Red Dzao, Black Dzao, Man (Khmer), Black H'mong and Ha Nhi villages. Picnic lunch en route. Dinner and overnight at the hotel in Lai Chau. Today is sure to be one of the highlights and most challenges of the trip as we will travel along one of the most beautiful roads in Vietnam. Cross many mountain passes, including Pha Din—a famous Indochina War site. Drive up on the top of the mountains and down to the other side of mountain rages. Arrive in Son La at the end of the afternoon. Dinner and overnight at the hotel. Morning: after breakfast, you will leave Son La for Mai Chau, the road mostly going down hill. Arrive at Mai Chau in late afternoon. Dinner and over night at Thai's House on stilts. Free in the morning, after lunch we say goodbye to the family where we spent 2 nights. Drive back to Hanoi and arrive at the end of the day. Dinner free and over night at the hotel in Hanoi. Morning, we’ll leave Hanoi to Bat Trang ceramic village. This is a village where we can visit to the most famous artist and might have a chance to paint on some productions. Continue to one of the most beautiful ancient Temple located right on the bank of Red River. Picnic lunch in the garden of the Temple. Afternoon, we will follow the dike again to Hai Phong city. Arrive Hai Phong and check in hotel. Dinner and overnight at the hotel in Hai Phong. Morning after breakfast, we leave Hai Phong for Halong bay. We will board a traditional wooden junk and begin an exploration of magical Halong bay, one of Southeast Asia’s premier tourist destinations. An excellent, fresh seafood lunch will be served on the boat while cruising to the first point, where is a floating fishermen village. We will have safety instructions before starting with our kayaks,through the most dramatically limestone formation, a giant cave, beaches and hidden lagoons. Relax and swim on a small beautiful beach upon on arrival. Dinner and overnight on a comfortable and charming junk. Wake up early in the morning to enjoy the aquamarine water of the bay at its best. After breakfast and early swim, we will visit Sung Sot cave. Back to the board and check out. Enjoy brunch while cruising back to Halong harbor. Transfer back to Hanoi by vehicle. Overnight at the hotel in Hanoi. Free until transfer to the airport for flight out. End of trip. My husband and I went on the 16-day Northern Vietnam tour, and we had such an amazing time. Neither of us have spent much time on bikes before, but our guides were very understanding and helped us get comfortable on the bikes before going. They were awesome people and we had so much fun hanging out with them for 16 days! Most importantly, I truly feel like our safety and comfort was their top priority at all times, and they went above and beyond to guarantee that!l. The views in the north are absolutely breathtaking, plus the little cafes you stop for lunch at along the way offered great authentic food. We’d highly recommend this tour to anyone looking to see Vietnam in this unique way.